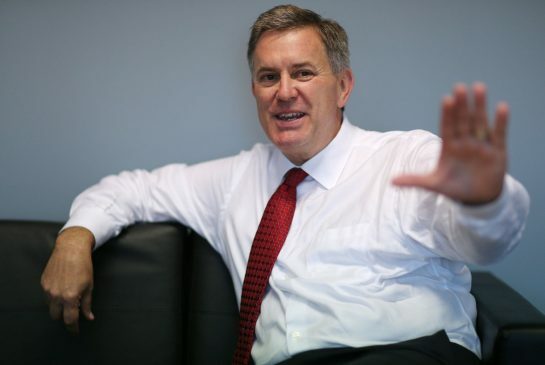 Tim Leiweke is interviewed by the Toronto Star's Cathal Kelly at Air Canada Centre in Toronto, July 15, 2013. MLSE president and CEO Tim Leiweke may be new to his job but he knows all about the Air Canada Centre’s most expensive seats being empty when the puck drops to start each period. Leafs fans with the option of enjoying the exclusive Platinum Club and other perks are notoriously late taking their seats. Part of his thought process was whether it was distracting to the team, given the comings and goings behind the Leafs bench. But he said it comes down to the kind of environment he is after. “I want a team that ultimately no one wants to miss a minute,” he said. But he said the problem is not restricted to Toronto. Hockey fans in L.A. are sometimes late taking their seats. “But during the playoff games, every seat was full and everyone was there before we even took the ice and introduced the starting lineups. There was an atmosphere there that was special and no one wanted to miss it. Leiweke said there were “some simple operational things” that could be done, such as making people better aware that the period was about to start. But it’s more than merely stopping the service of food and drinks, he said. It’s about building a product that puts people in their seats. Click here to read Doug Smith's thoughts every day. Click to read Richard Griffin's Blue Jays baseball blog.